Harmony is a great introduction to English Paper Piecing. It's a simple, beautiful project, so you can learn the technique and have a project that can be easily finished. (This is a beginning paper piecing project, but to finish the project, students should have beginning quilting skills.) Monday, June 10 & 17, 5:30 - 8:30 p.m., $40 for the two sessions, Dana Lahargoue, supply list. 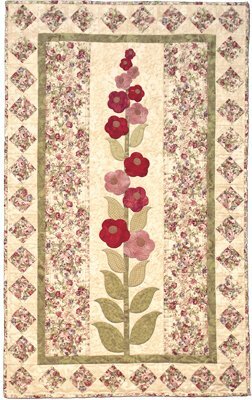 NOTE: The pattern shows appliques flowers, but Dana changed them to English Paper Pieced flowers.